We’d love your help. Let us know what’s wrong with this preview of Justice League International, Vol. 2 by Keith Giffen. 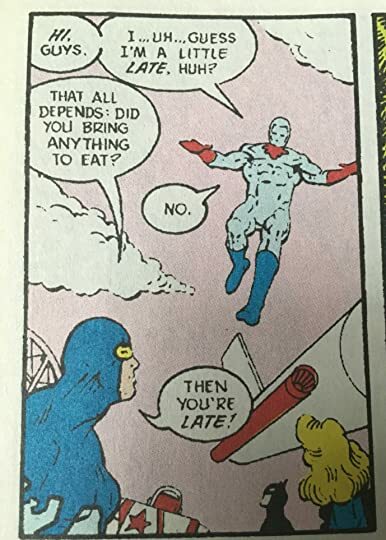 To ask other readers questions about Justice League International, Vol. 2, please sign up. What a shame. I feel like the creative staff had really gotten a handle on the characterization and tone they wanted to go with for the series, and it could have been really good. Unfortunately, it got snared in crossovers (something about Manhunters, I don't even know) and team-ups (Suicide Squad, which ok) and couldn't really be its own book. That said, reading the characters reacting to the events is still quite entertaining. A super nitpicky side note: this collection includes the '87 annual What a shame. I feel like the creative staff had really gotten a handle on the characterization and tone they wanted to go with for the series, and it could have been really good. Unfortunately, it got snared in crossovers (something about Manhunters, I don't even know) and team-ups (Suicide Squad, which ok) and couldn't really be its own book. That said, reading the characters reacting to the events is still quite entertaining. poor stories. just not that interesting. This volume is really badly fractured, starting with a not-funny Annual, that's out of order, and moving through some Millennium crossovers. There's some funny in between and the last two issues are a nice cap to the year, but there's not a lot of coherence. With the exception of the opening issue of this volume (Issue 7, "Moving Day"), the rest of this volume is a snoozer! The remainder of the book was given to crossovers for two different, unrelated events ("Millennium" and then a x-over with SUICIDE SQUAD), as well as a Annual that should have been included in Volume 1, as that's where it took place! Other than the first appearance of G'Nort, who happens to be one of my favorite DC characters, there is really no need to want to check this Volume With the exception of the opening issue of this volume (Issue 7, "Moving Day"), the rest of this volume is a snoozer! Other than the first appearance of G'Nort, who happens to be one of my favorite DC characters, there is really no need to want to check this Volume out. Seriously, even you are a completist, there is really nothing here that you could not live without. Promise! I wish they're done a better job with the printing. For a nifty hardcover, some of the lettering is unclear, or even unfinished, and though I prefer a flat-paper to the current glossy stuff, the pages here are positively brittle. Still, great stories. Bruce, Ted, Michael and Beatriz going undercover in Bialya is a great arc, balanced nicely by the fun cosmic adventure of J'Onn, G'nort, Red and Barda chasing Scott across the cosmos. Vol. 2's Max Lord stories, issues 11 and 12, are still among the I wish they're done a better job with the printing. For a nifty hardcover, some of the lettering is unclear, or even unfinished, and though I prefer a flat-paper to the current glossy stuff, the pages here are positively brittle. This one is stifled by a terrible event and a poorly placed (but otherwise decent) annual. Comedy is, unfortunately, not center place and the central plot revolves around the event and its wake. The author also saw fit to have Batman quit like an ungrateful child. Delightful. I had forgotten how good these stories were. There is no doom and gloom nor darkness that today's comic stories convey. Great writing, gorgeous art and fun characters make for some really great stories. Justice League gets better going Justice League International. New Members Captain Atom and Red Rocket join up. Something's going on with Maxwell Lord, and Guy continues to have a pleasant demeanor which shocks the rest of the team. Lots of laughs and intrigue. Based on Sesana's warning, I immediately flipped to the back of the trade to read the Annual *first*, rather than last. Ultimately, even that didn't save this chum bucket. First question: has Booster Gold always been such a non-egalitarian? This probably sounded normal in the 80's, but shouldn't a 25th-century dude be way more progressive? Third Based on Sesana's warning, I immediately flipped to the back of the trade to read the Annual *first*, rather than last. Ultimately, even that didn't save this chum bucket. Third question: since when did Wilson Fisk become a Firestorm adversary? 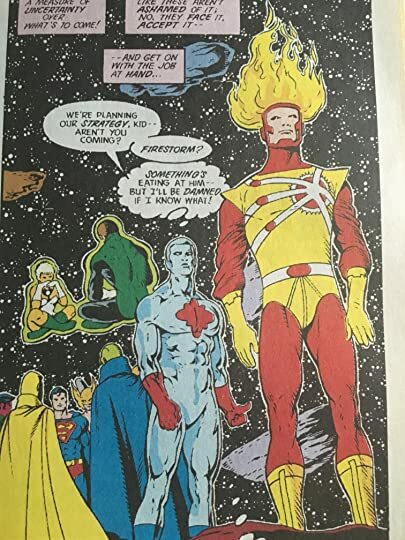 Fifth question: did McGuire explicitly intend Firestorm's costume to *literally* look like he was wearing his underwear over his pants? Definitely a letdown after the awesome first volume. This story jumped around a bit. 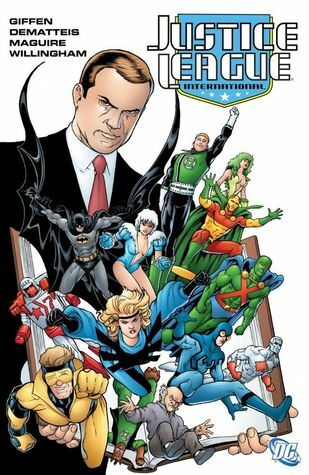 They provided a little catch-up synopsis on the Millenium events and the struggles with the Manhunters, but without knowning that storyline very well it was difficult to invest in the little snippets that involved the JLI. The opening story was fun, but after that it suffered from the starts and stops. Not great, hopefully volume 3 will get us back on track. Continues the good and bad of the first collection. Good for the atypical breakout of level-headed discussion instead of super powered brawls and the team dynamic sarcastic humor. Bad mostly because the humor seems to paint all of the characters the same, even Batman doesn't quite seem himself. Altogether a decent way to pas them time, but not extraordinary. This collection is hardly that... the stories mostly don't go together, or are formed around bigger DC universe stories that are not featured in this book. As a result, it was pretty scattered, and although there were some important (I think) moments, I never was very engaged. Probably not worth your time, unless you want to see who Maxwell Lord was working for/with and what happened to him. Ehh, I'm not too invested in any of the characters and they're far too silly to care about. Batman's frustration with the team as well as general lack of team-player qualities make him annoying. And everyone on the team is white, which is also kind of annoying. It was an interesting trip to the 80's though. This is where the bwa ha ha JLA starts to surface. What I really like about this volume is that when there are crossovers and events they have a one page synopsis telling you what you need to know to get through this issue. Plus any issue with G'nort in it is an instant classic. While this isn't as good as the first volume of the Giffen & Co. run on JLI, it's still head & shoulders above a whole lot of comics. This volume is hampered by the DC-wide Manhunters/Chosen storyline (ack - what a waste of time). This second volume is great. The international era is so funny and Guy Gardner with amnesia is hilarious. The Crossover with Suicide Squat is nice, but the story in the annual is not good, i don't remember if what happens have repercussion ahead in the series. Not quite as good as the first volume; there's some artistic changes, the team loses some of their more interesting members, and some of the shtick is beginning to get old already. Still, these remain super heroics, not comedy, and they're still strong stories. Far cry from the first edition. Don't waste your time with this or the rest of the series. Just read the first one. This is a really fun book. The team has great chemistry! A little uneven compared to vol 1 because of the man hunter cross over but still a fun comic plus an appearance of g'nort!!! What a slog. The first volume was fun. There are moments of fun here but the story is awful. Crossovers can be the death to momentum. And so much happens between issues. Just awful. Just plain fun comics. I don't have anything weighty or smart to say about this; they're just well-made. And it's amazing how much innuendo the writers got away with, for the time! Diverting, but, sadly, a serious step down from volume one. However, I have hope for volume 3. The first two-thirds were disappointing, but in the last third it returned to the writing style that I had enjoyed in the first volume. Keith Ian Giffen is an American comic book illustrator and writer. He is possibly best-known for his long runs illustrating, and later writing the Legion of Super-Heroes title in the 1980s and 1990s. He also created the alien mercenary character Lobo (with Roger Slifer), and the irreverent "want-to-be" hero, Ambush Bug. Giffen is known for having an unorthodox writing style, often using characters Keith Ian Giffen is an American comic book illustrator and writer. He is possibly best-known for his long runs illustrating, and later writing the Legion of Super-Heroes title in the 1980s and 1990s. He also created the alien mercenary character Lobo (with Roger Slifer), and the irreverent "want-to-be" hero, Ambush Bug. Giffen is known for having an unorthodox writing style, often using characters in ways not seen before. His dialogue is usually characterized by a biting wit that is seen as much less zany than dialogue provided by longtime collaborators DeMatteis and Robert Loren Fleming. That approach has brought him both criticism and admiration, as perhaps best illustrated by the mixed (although commercially successful) response to his work in DC Comics' Justice League International (1987-1992). He also plotted and was breakdown artist for an Aquaman limited series and one-shot special in 1989 with writer Robert Loren Fleming and artist Curt Swan for DC Comics.